I didn't think I would make it but I did get everything finished for the photo shoot. I did quite a few videos of the shoot which I have included in my blog for the TKGA site. It should be posted next week some time. I am going to start posting every other week, starting in two weeks. My next entry will be May 29, right before I go to TNNA in Columbus. I think I will start tracking how long it takes for lessons to arrive from outside the US. I can report it takes almost two weeks from Chile. I think the best service is from Japan. I feel like a broken record but it is a good idea to photograph your swatches, front and back, before sending them to me. I send my letter by email the day I review the swatches but it can take weeks for the lesson to get back to you! The tip this week is about Right and Left Slanting M1 increases. The"right" and "left" do not refer to the side of the piece where they are placed by rather the direction the top leg of the increase slants. 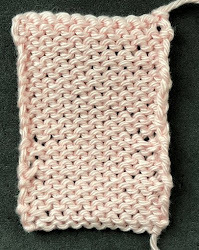 To make an M1 increase you use the horizontal strand between two stitches. If you just knit into it, a hole results. It produces a small yarnover, basically. To make a right or left slanting M1 you need to twist the horizontal strand. Look carefully at the photograph below. Notice that all of the increases are mirrored. The first three increases at the bottom have the right slanting ones at the right and the left slanting at the top. The top three increases reverse this. If you have trouble seeing the increases, this photograph has them marked. This photograph indicates the type of increases. I did finish the jumper in time for the photo shoot. Here is a photo on my dress form. Notice I am not including any photos of things I am knitting as all I am doing right now is getting yarn ready for the Yarn Tasting. I took 9 boxes of yarn for the goody bags up to Zanesville with me. Now I have to organize the tasting yarns. (I've got 22 different ones so far and more boxes are arriving every day!) Charles Gandy, Suzanna Bryan and Binka Schwan (who will man the Brilliance Bar at the conference) are helping me wind the balls. Since we upped the number of participants to 100, this is quite a bit of work! Amazing how the left slanting on the right and the right slanting on the left actually look very good. I have always tried to do it the other way but that is why I read your blog - it is never too late to learn! Thanks for another good tip!